-- Select a Size/Color -- Small - 4.5 inches Large - 7 inches - Out of Stock! 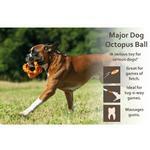 The Octopus Retrieval Ball is the perfect toy for the dog with energy! Hours of fun can be had with the Octopus Retrieval Ball, not only can you throw, fling, roll or play tug-o-war with this toy, but you will enjoy watching your dog use up all that boundless energy chasing catching and tossing it in the air. 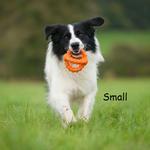 The knobbed rings allow for easy carrying or holding by both dog and owner and ensure you can really gain some distance in throwing it. 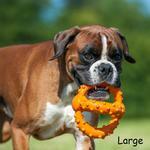 Made with durable natural rubber, this toy is not only long lasting, but the knobbed rings will even massage your dog's gums while being held in their mouth. Posted On 02/06/17 by Melissa from , WV Yes, Melissa recommends this product! I love the dog dresses you have available. I have five female Yorkshire Terriers and one male Yorkie. I like to dress them for special occasions and for warmth after grooming and during winter.